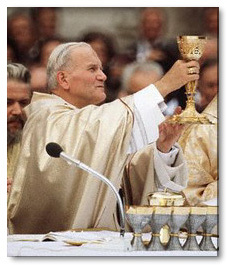 In his encyclical "Ecclesia de Eucharistia," our beloved late Holy Father, Pope John Paul II, taught, "In the celebration of the Eucharistic Sacrifice, the Church prays that God, the Father of mercies, will grant His children the fullness of the Holy Spirit so that they may become one body and one spirit in Christ. In raising this prayer to the Father of lights, from whom comes every good endowment and every perfect gift, the Church believes that she will be heard, for she prays in union with Christ her Head and Spouse, who takes up this plea of His Bride and joins it to His own redemptive sacrifice" (No. 43). Please keep in mind that the tradition of offering Masses for others, particularly the dead, originates in the very early Church. Inscriptions discovered on tombs in Roman catacombs of the second century evidence this practice: for example, the epitaph on the tomb of Abercius (d. 180), Bishop of Hieropolis in Phrygia, begs for prayers for the repose of his soul. Tertullian (c. 200) attested to observing the anniversary of a spouse with prayers and sacrifices, i.e. the Mass: "Indeed she prays for his soul, and requests refreshment for him meanwhile, and fellowship with him in the first resurrection; and she offers her sacrifice on the anniversaries of his falling asleep" (On Monogamy, X). Moreover, the Canons of Hippolytus (c. 235) explicitly mentions the offering of prayers for the dead during the Mass. St. Cyril of Jerusalem (d. 386), in one of his many catechetical discourses, explained how at Mass both the living and dead are remembered, and how the Eucharistic Sacrifice of our Lord is of benefit to sinners, living and dead. St. Ambrose (d. 397) preached, "We have loved them during life; let us not abandon them in death, until we have conducted them by our prayers into the house of the Lord." St. John Chrysostom (d. 407) stated, "Let us help and commemorate them. If Job's sons were purified by their father's sacrifice, why would we doubt that our offerings for the dead bring them some consolation? Let us not hesitate to help those who have died and to offer our prayers for them." St. Augustine (d. 430) recorded the dying wishes of his mother, St. Monica in his Confessions: "One thing only I ask you, that you remember me at the altar of the Lord wherever you may be." Finally, Pope St. Gregory (d. 604) said, "Let us not hesitate to help those who have died and to offer our prayers for them." We find not only the origins of this practice dating to the early Church but we also clearly recognize its importance. The special ministerial fruits of the Mass are applied to the particular intention of the Mass, i.e. "for whom the Mass is offered." The special personal fruits of the Mass benefit the celebrating priest who acts in the person of Christ in offering the Mass and to the people who are in attendance and participate in the offering of the Mass. These fruits are both extensively and intensively finite, since each of us is finite. Therefore, the more a Mass is offered, the more benefit is conferred. For example, all things being equal, 10 Masses offered for the repose of a soul confer 10 times the benefit of one Mass. The intention of the Mass is also determined by various factors: The Church may stipulate the particular intention; for example, all pastors are required to offer one Mass on Sunday for the intentions of the living and deceased parishioners of a parish. A priest may also have his own particular intention in offering a Mass, such as the repose of the soul of his parents. Finally, a person may ask a priest to offer a Mass for a particular intention; usually, a stipend is given to the priest for offering the Mass, which thereby in justice creates an obligation which must be satisfied. Saunders, Rev. William. "Mass Intentions." Arlington Catholic Herald.